This qualification consists of one mandatory unit and is typically delivered over a period of 1 day with a minimum contact time of 6 hours. The topics covered include the role and responsibilities of the paediatric first-aider and providing first aid for an infant or a child who is unresponsive and breathing normally. 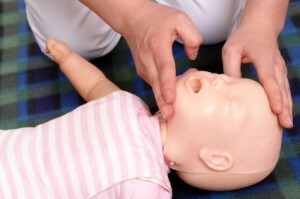 The qualification also covers how to administer first aid to an infant or a child who is choking or suffering from hypovolemic shock and how to treat minor injuries. All successful students will be issued with a level 3 award in Emergency Paediatric First Aid certificate. A Level 3 award in Emergency Paediatric First Aid (RQF) certificate valid for three years is issued on successful completion of the course. Certification is validated through an approved OfQual awarding body.